Zion Market Research has published a new report titled “Freezer Bags Market by Type (Flat Bags, Satchel Bags, and Block Bottom Bags), by Material (High-Density Polyethylene (HDPE), Medium-Density Polyethylene (MDPE), and Low-Density Polyethylene (LDPE)), and by Application (Food, Pharmaceuticals, Medical Devices, and Others): Global Industry Perspective, Comprehensive Analysis, and Forecast, 2018—2024”. 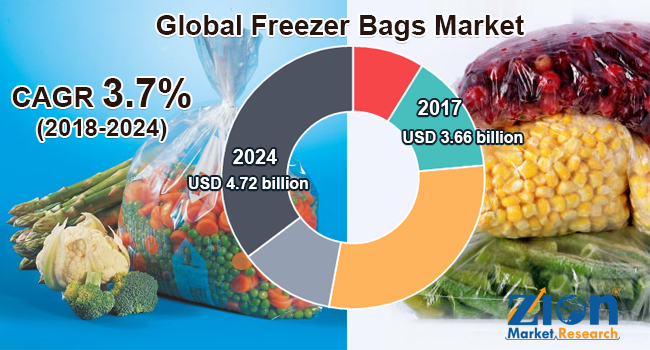 According to the report, the global freezer bags market was valued at USD 3.66 billion in 2017 is expected to reach USD 4.72 billion by 2024, at a CAGR of 3.7% between 2018 and 2024. Freezer bags are used to store food products, pharmaceutical products to enhance their shelf life. These freezer bags are generally made of plastics like high-density polyethylene, low-density polyethylene, and medium density polyethylene. During the manufacturing process of freezer bags, an additive is added to avoid the brittleness of products. These bags help to preserve products for a longer period of time. Therefore, these bags are widely used in the pharmaceutical and food, among various other industries. The freezer bags market is expected to grow fast in the years ahead, owing to the increasing consumption of meat globally. With the rising population in developing countries, such as India, China, and Brazil, the demand for processed food is expected to boost the demand for freezer bags in the food industry. In addition, the pharmaceutical industry has grown drastically in the last few years, which, in turn, is expected to increase the use of freezer bags for pharmaceutical packaging. These are some other factors that are likely to support the freezer bags market in the future on a global scale. However, due to stringent government regulations on plastic use and fluctuating prices of raw materials might hamper the freezer bags market. On the other hand, the increasing research and development activities in the production of freezer bags are estimated to offer several opportunities to the market players in the future. The global freezer bags market is classified based on type, material, and application. By type, the global freezer bags market includes flat bags, satchel bags, and block bottom bags. Satchel freezer bags held the largest market share, followed by block bottom bags. The share of block bottom bags is expected to grow at the fastest pace over the forecast time period. By material, the global freezer bags market includes high-density polyethylene (HDPE), medium-density polyethylene (MDPE), and low-density polyethylene (LDPE). High-density polyethylene is likely to dominate the global freezer bags market in the future, owing to its wide usage to manufacture freezer bags. By application, the global freezer bags market includes food, pharmaceuticals, medical devices, and others. Food application segment is the largest consumer of freezer bags, owing to the growing food industry globally to preserve food products. Geographically, the global freezer bags market includes Europe, North America, Latin America, Asia Pacific, and the Middle East and Africa. North America contributed the largest share to the global freezer bags market in 2017, owing to the high disposable income of consumers and rising population, which, in turn, is likely to propel the application of freezer bags in the food and pharmaceutical industry in the region. Additionally, the consumption of meat is increasing in China and India, which is expected to boost the usage of freezer bags in this region. Some key market players of the global freezer bags market includes S. C. Johnson & Son, Inc., International Plastics, Inc., Reynolds Consumer Products LLC, Weston Brands LLC, Inteplast Group, Abbey Polythene Ltd., Universal Plastic Bag Manufacturing Co., Maxpak Australasia Pty. Ltd., Polybags Limited, Weifang ChangLe Shuguang Industry Co., Ltd., Great American Packaging, Inc., and Convex Innovative Packaging, among others.